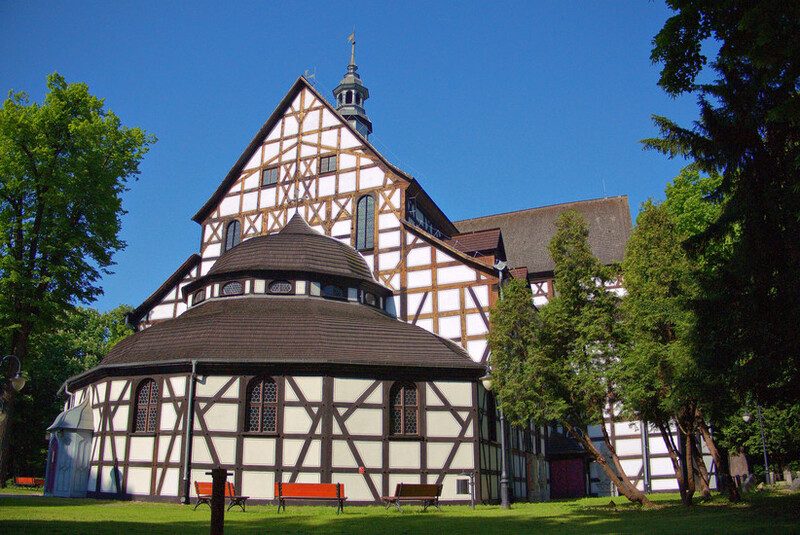 The last of the three peace churches to be built is actually the closest to Wrocław, about 50 kilometres southwest from the Lower Silesian capital. Construction in Świdnica took forever, as funds were short and work on the church continually came to a halt due to a lack of timber. Only a donation from Hans Heinrich of Książ (see Książ Castle) - who donated 2000 tree trunks from the forest surrounding his castle - allowed work to be completed, in 1657, almost five years after the emperor had given permission for building work to begin. 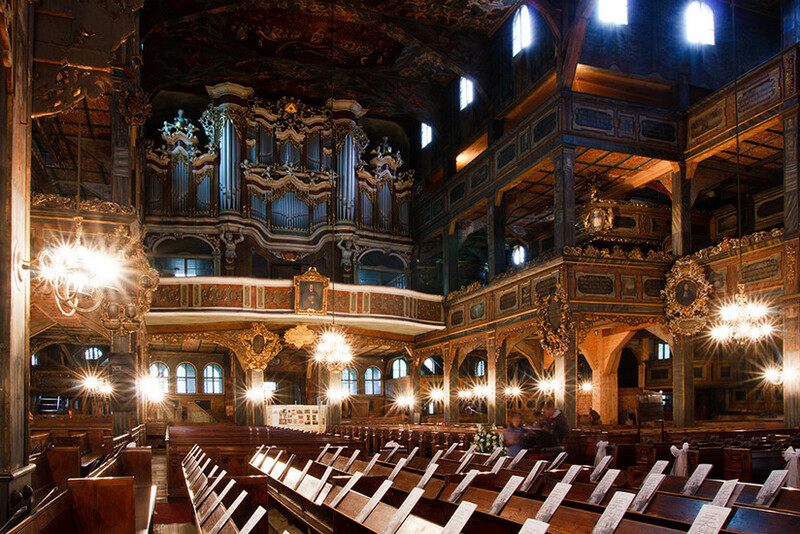 Different in layout to the churches at Jawor and Głogów it was built in the form of a Greek cross, and when completed it was the largest wooden church in Europe, and could accommodate 7500 worshippers. 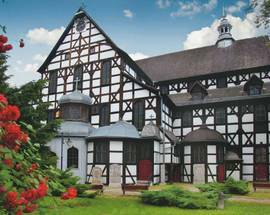 The interior – even for those who have visited Jawor – is quite a sight. Like Jawor, there are brightly decorated galleries to accommodate the masses, and a number of private boxes for the wealthy. The most impressive is the domed box of the Hochberg family (who had made construction of the church possible), topped with the Hochberg coat of arms. The church’s astonishing altar, added in 1752 to mark the centenary of the emperor granting permission for the church’s construction, is one of the finest in Poland and perhaps the most impressive of all protestant altars anywhere in Europe. It is the work of August Gottfried Hoffmann, a Dresden sculptor who had settled in Świdnica, and its central scene depicts the baptism of Christ in the River Jordan with the Holy Spirit watching from above. Statues of Moses and Aaron flank the scene. 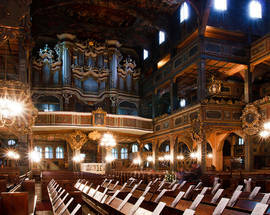 The church’s working Baroque organ, installed in 1666, is original. 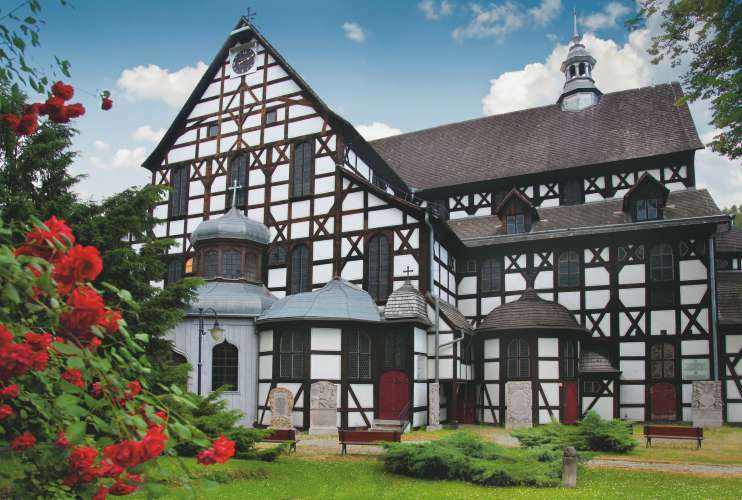 There are a couple of buildings in the church’s grounds that should not be overlooked: the Belfry and the Lutherheim (Luther’s House, originally a school), both built in 1708. If the weather’s good, it’s also worth exploring the grounds to take a look at the tombstones, many of which are intricately engraved. 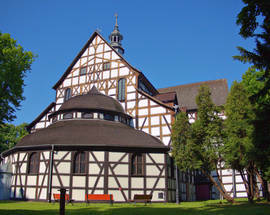 Świdnica, though best known as home to one of the Churches of Peace, is itself well worth a day trip from Wrocław. A fine medieval town that survived the ravages of the 20th century more or less intact, it is in the classic Polish mould, centred on a colourful Rynek. Once in Świdnica it all comes together. The town’s main station, Świdnica Miasto, is just 5mins from the central Rynek (market square), which is dominated by the 16th century Town Hall that sits in the middle. There is a reasonably helpful Tourist Information Office on the far side. Besides the Church of Peace (which is a ten minute walk north of the Rynek) the town’s stand-out sight is the 14th century Sts. Stanisław & Wacław Cathedral, at 103 metres the tallest church in Silesia. Find it on Plac Jana Pawla II, one block east of the Rynek. 50km southwest of Wrocław, driving to Świdnica and taking the train from Wrocław actually take about the same amount of time - just over an hour - if you take a direct train, that is. Unfortunately, direct trains aren't super frequent, so make sure to check the Polish railways site (rozklad-pkp.pl) and plan your trip accordingly. 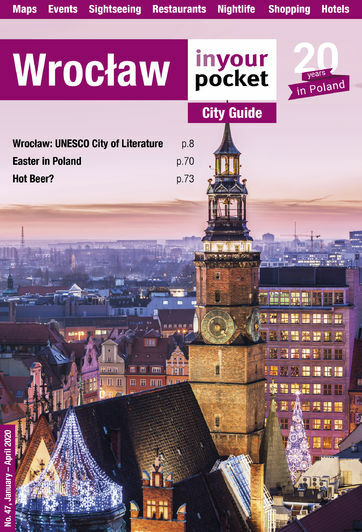 The trip costs around 15zł (one-way) and the Peace Church is easily accessed on foot from the train station - just a 15-minute walk to the north through the market square.